Kvitfjell, Norway – One “crazy fast” turn got Squaw Valley’sTravis Ganong off on the wrong foot in Saturday’s Audi FIS Ski World Cup downhill won by Norway’s home-crowd favorite Kjetil Jansrud. There have been seven Norwegian downhill wins in Kvitfjell in the past six years, but none was on the original full-length 1994 Olympiabakken downhill track since Lasse Kjus’ win in 1997. 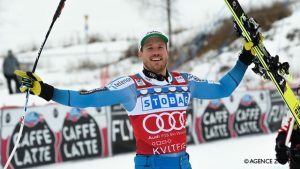 After taking over the downhill red leader bib on Friday, Jansrud was in excellent shape and was unbeatable on Saturday. Jansrud edged out Italy’s Fill by just 0.08 seconds, while Switzerland’s Beat Fuez was third. Ganong was 17th, as Bryce Bennett, also of Squaw Valley, was the only other American in the points, finishing 19th. The rest of the Americans also struggled on the cold, hard track. Andrew Weibrecht (Lake Placid, N.Y.) finished 41st and Jared Goldberg (Holladay, Utah) did not finish following a scary crash after flying off a jump and into the safety netting. Goldberg was standing following the incident, but was taken off the mountain on a sled as a precautionary measure.